When people ask us “What is the best guitar wireless system?” and they’re not looking for a specific price range, just best of the best, the GLXD16 model from Shure is often the first item that pops up in our noggins. This is a high-end item with a high-end price, but also a stellar package that includes all the top-level features we ever needed in a wireless system. Make sure to check out all the extra details in the full review. One of the things that instantly grabs your attention about this device is the fact that the system features a stomp-box transmitter. This allows you to conveniently place the device in your pedalboard and keep it close to your guitar and the receiver, securing a stronger signal and higher reliability. The gizmo offers a working range of up to 200 feet (60 m), and we can confidently say that you will experience ZERO sonic interference or signal loss within 100 feet (30 m), which is more than enough for most players, even those performing at large venues. The device allows you to control up to four compatible systems in standard audio settings, and even up to 8 systems in ideal conditions. The package includes a single GLXD6 receiver, a GLXD1 body-pack transmitter, a WA305 locking-thread cable, a SB902 rechargeable lithium-ion battery, a PS23US power supply and even a SBC-USB-MicroB wall battery charger. You really get everything you need, and not a single additional accessory is needed. As far as frequency adjustments go, the device is very easy to operate, utilizing a minimal number of buttons with maximum efficiency. Another very cool feature you can activate through the frontal foot-switch is the tuner feature. 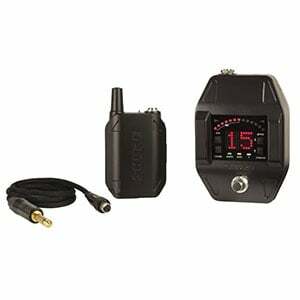 The on-board tuner is very accurate and can stand on par with most stomp-box tuners on the market today. So if your argument against buying this item is that it will take up too much pedalboard space, you can simply place it where your tuner used to stand. When plugged in, this fella is just smooth as a whistle! Within the 100-foot range, we experienced absolutely no sonic interference, signal loss or low-quality sound. There is no compression to be found here and the audio quality is fully superior to the quality of classic cabled options. As long as there are no titanium walls in your way, no object will be able to interfere with the signal. Additionally, the device utilizes a lithium-ion battery, which can deliver up to 16 hours of continuous operation. Battery charging is very quick and convenient, and we are really left with no choice but to give this fella a maximum of five stars. You get what you paid for here, a high-end, top-level device that’s worth every cent. Yes, the price is not in everyone’s reach, but the fact remains that everything about this device is top-notch and that Shure GLXD16 is a clear contender for the title of the best guitar wireless system in the world. For more info about Shure GLXD16, click here.